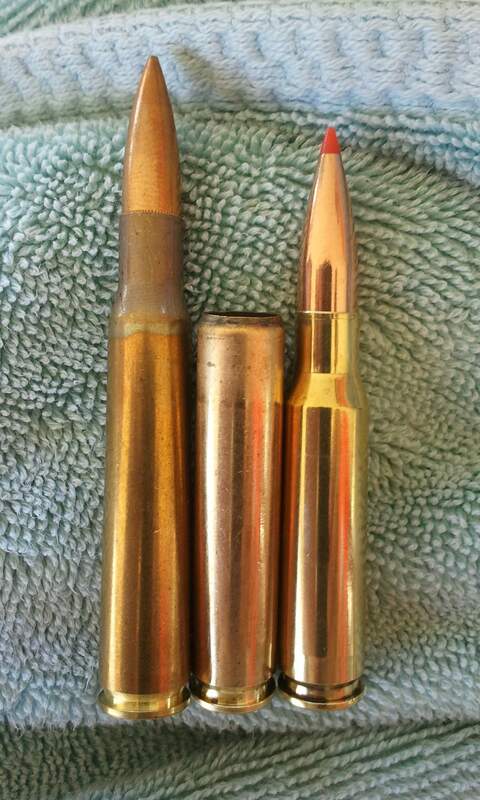 It is generally not good to put the wrong caliber ammunition in a firearm. What REALLY is the best gun for SHTF? Mark Hatfield submitted this article. What REALLY is the best gun for SHTF, the Zombie Apocalypse, and the End of the World as we know it. Maybe it’s not what you think. A Modest Proposal. Ok, so I stole the ‘Modest Proposal’ line from Jonathan Swift. Just trying to show that I’m a classy guy. What are the usual concerns? High ammunition capacity, stopping power, accuracy (But how much? ), cost, availability of ammo, cost of ammo, length, weight, reliability, east of maintenance, available of spare parts, iron sights or the $1000 perfect combat optics, and on. Must be a hundred thousand articles ‘out there’ about this. It’s actually tied into another question which always pops up, ‘What if you could have only one gun?’. The late ‘Skeeter’ Skelton wrote about that question using one of his fictional characters, an old Texas rancher whom he called Dobe Grant. Reportedly, ‘Dobe’ was a composite of several real Texan old timers. When the ‘one gun’ question was posed to the tough old dude (Oops, ranchers aren’t ‘dudes’), he wanted at first 4 guns. A scoped 30-06, a 12 gauge shotgun, a revolver in 44 magnum, and a revolver in 22 rimfire. When pressed to get to one, the first dropped was the shotgun, then the rifle. The rancher was skillful enough that he could use the 44 to hunt big game and to deal with predators upon his livestock. The 22 revolver was just so useful for just about everything that he would not give up that option. But that is still two guns. He later returned to Skeeter and said ‘If I could have only one gun, it would be a 22 rifle’. Now obviously, the 22 rifle is not going to be carried concealed unless you go about wearing the ankle length coat as do most of the pseudo-serious make believe ‘tough guys’ in the current trend of movies and television. In a major societal breakdown, having a concealed weapon may be a very wise thing, but for the moment, let’s just think about defending your home. What about the common 12 gauge shotgun? Definitely powerful, can ‘do the job’, but limited ammunition capacity and the individual rounds are big relative to other types of ammo. More important, the recoil is too much for many people, perhaps most people. Perhaps fine for us macho kind of guys but for the wife or the older kids? The deer rifle, or hog rifle. Again limited ammo capacity, possible recoil concerns. The bullets may penetrate too many walls and end up places where you didn’t want them to go. What about those Evil Black Rifles, such as the AK and the AR. Truth is that they are pretty much designed for this type of thing. These seem to be the preferred rifles for those people who have decided that they and their loved ones will not become victims. But cost? That’s variable, and most owners tend to modify these rifles and add accessories, then there’s the price of ammo. Perhaps you’re an exSEAL, Special Forces, SWAT, or some other thing which too many people falsely claim to be, or maybe you just really know your gun, it does what you want it to do, and you can make it perform, but can your spouse use it, or the older kids, or the relatives who are sheltering with you? (And yes, the rest of the family really should be prepared as well as yourself). Rather than one ‘almost perfect’ $1000 rifle with an attached ‘superest ever combat sight’ for another $1000, couldn’t you get several 22 rimfire rifles and a whole lot of ammunition? If I was a violent criminal offender who had decided to invade an occupied home and I know that the owner had the civilian version of the AK-47 I would be a lot more careful, especially if I thought the owner actually knew how to use it. If I knew that instead of one defender with a good gun, that daddy, mommy, and the 2 older kids might be defending their home, together, all with minimally adequate but adequate weapons, that home would not be worth my trouble, too much risk to me, even if I had some helpers. At the ‘mart’ stores, 500 rounds of 22 rimfire ammo is less than 25 dollars. The ‘shelf life’ of 22 rimfire ammo is not as good as centerfire ammo but generally will not start to experience misfires until it is over 10 years old or more. The cost of the rifles is far less than military style rifles. The useful distance for use of these rifles for defense is much less than a military style rifle but it is long enough and longer than that of most shotguns. Hand the untrained person a modern defensive handgun and have them try to hit a man sized target at living room distance, not so easy for many people. But give them a 22 rifle, and they can quickly be good at 50 yards and beyond. Does this mean that I will give away my accessorized customized military style rifle which is outfitted with super optic sights in exchange for a 22 rimfire, heck no. But if I had to equip several friends or family members who have limited funds and training, this is worth considering. This article is specific to correcting malfunctions (jams) occurring in semi-automatic handguns particularly those which may occur during periods of intense social interaction, such as when you are attempting to shoot someone due to dire need. Not long ago, one of the Loose Rounds founders asked if I might write such an article and I did but they wanted something more technically specific. ‘No problem’, says me, ‘When do you want it?’ Then just earlier today, I was perusing a hot off of the newsstand gun magazine while seated in the smallest room of my home and saw that there was an article nearly identical to that which I had planned to write. However I believe that my technique is slighter better and not everyone may see that magazine, so I will continue with my not plagiarized article. Reduce the risk of malfunction by keeping the gun clean and correctly lubricated by whatever means is proper for that model. Many semi-autos will jam if ‘dry’, meaning not lubricated. Don’t carry a dirty gun. This can be important as well for legal reasons. Some situations can occur where the sight of your gun causes the problem person(s) to leave with no shots fired. If they later falsely claim that you fired at them the official police record of your gun being unfired can be important. NOTE: This also means that you never ‘just go home’ after such an event. ALWAYS report the incident to the police. ‘Limp wristing’ handguns has nothing to do with sexuality but all to do with your grip, wrist, arm, and stance, moving or standing still. Basically, for semi-autos, that big heavy part at the top of the gun moves when you fire it. If you allow the bottom part to move as well, the gun may jam. Even if you are shooting while walking or running, your grip and wrist must be firm. There are a number of ways that the semi-auto handgun may malfunction. Instructors used to teach different methods for each type of malfunction, some even involved ‘karate chopping’ empty brass which might be sticking out of the ejection port. Here is a universal method. I do not remember which of my several teachers first presented this technique or I would give them the proper credit. GET MOVING. If you are not already behind something which can stop the bullets coming at you, MOVE. Move to cover, concealment, or if nothing else only to confuse or delay your attacker. Don’t just stand there. 2. Rotate the gun so the ejection port is facing the ground. 3. ‘Rack’ (move) the slide fully in both directions several times. Be certain the slide goes all the way forward and all the way to the rear. 4. Shake the gun, may be simultaneous with racking the slide. 5. Return the gun to the upright position and insert a new loaded magazine. If a new magazine is not available, quickly glance at the old one to see if the top rounds are not out of position or mag is defective, correct if necessary and then insert the mag. 6. Rack the slide fully to the rear, release it and let it go forward on its own. How does this differ from some other methods? The most common traditional method is currently called ‘Tap, Rack’ and previously known as ‘Tap, Rack, Bang’. One simply uses the support hand to vigorously slap or hit the bottom of the magazine to ensure that it is fully seated, rack the slide fully to the rear, release the slide, then continue shooting. This works very well if the round of ammunition was defective and simply did not go off but does not address other problems. On the topic of racking and releasing the slide. Unless for the specific reason of a drill such as these, normally always allow the slide to go forward on its own, never move it forward or assist it. Let it go all by itself, malfunction drills can be the exception. Not letting the slide go forward on its own may result in the slide not going all the way forward. In that case the gun will probably not fire and if it should fire while not ‘in battery’, damage to the gun, your hands and face may result. A technique previously taught for ‘stovepipes’ is where an empty piece of brass is trapped in the chamber but is mostly sticking out from the side of the gun, was to run the edge of the shooters hand along the slide like striking a blow, to knock out the offended brass while hopefully not damaging your own hand. 1. Release the slide (allow it to go forward). 4. Rack the slide to feed new round. Once while attending a class taught by members of a prominent shooting school, it was repeatedly and firmly announced that the above method ALWAYS works. The instructors induced a malfunction in each students gun, first to practice ‘Tap, Rack’ and a second time to practice the above method which always works. It didn’t work. Releasing the slide (assuming it is in the rear position) just moves a new round from the magazine into the place which is probably already filled with rounds competing for the same space or empty brass which does not want to leave. Removing the magazine first makes more sense. This allows the offending items to leave the gun through the ejection port or through the magazine well which is much larger and pointing down whereas the port is on the side of the gun. Releasing the slide or moving the slide forward on rounds or brass which are already wedged in that area may just jam them in further. Another variation is to engage the safety lever (if present) before attempting any action. Generally, that’s a real good idea. However, it is an extra step in the beginning and an extra step at the end, removing the safety might be missed under stress further slowing you down. You may have had a defective magazine. I currently have 7 new Glock factory magazines of several different production runs which refuse to release the ammunition which they so securely hold deep inside. I suspect that when Glock changed the mags to be ‘drop free’ they made errors on the interior dimensions. This is another reason to never carry only the one magazine which is in the gun. What is even worse, your malfunction may have been caused by having a bullet stuck in the barrel, a primer which fell out of the case and into the guns mechanism, mud/snow/water in the barrel or other critical areas, a bullet which became too deeply seated in the case and caused excessive pressure, brass cases which come apart and portions remain in the chamber, broken or weak ejectors/extractors/springs, and other fun things, even from being clogged with gore from a person just shot at contact distance. Many things can go wrong which while thankfully rare, cannot be fixed easily or not at all during the hot action of a gun fight. I know people from ‘high stress’ careers who never leave the house without at least two guns. Accessing the second gun may sometimes be wiser that trying to fix the primary one. A second gun can be handed to a trained spouse, partner or trusted friend. The second gun is also handy if the first is dropped or taken from you. All of this is another major reason why is it always better when possible to de-escalate potentially violent situations and avoid trouble when you can. 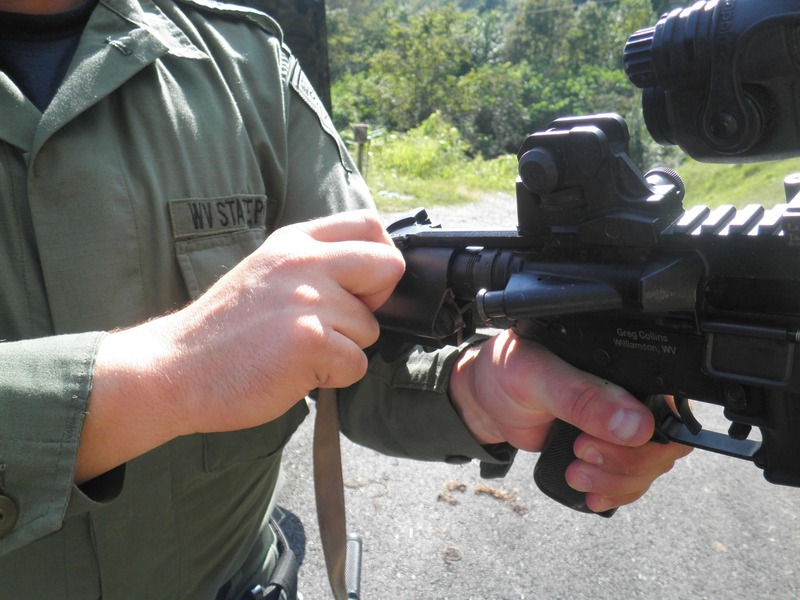 A current hot trend for the AR15 is for ambi controls. This is one of the trends I find to be worth all the hype. I can think of no real down side to being able to work your firearms just as easy with your alternate killing hand as you do with your main killing hand. Sure its more parts that take training and have the chance of breaking , but, you need to be training any way and anything can break anytime so there is no need to not convert to a new thing that is worth it. My friend is left handed so he always uses ambi parts on his carbine when he can get them and they are worth the money. One of the ambi controls he bought is the Badger Ord. 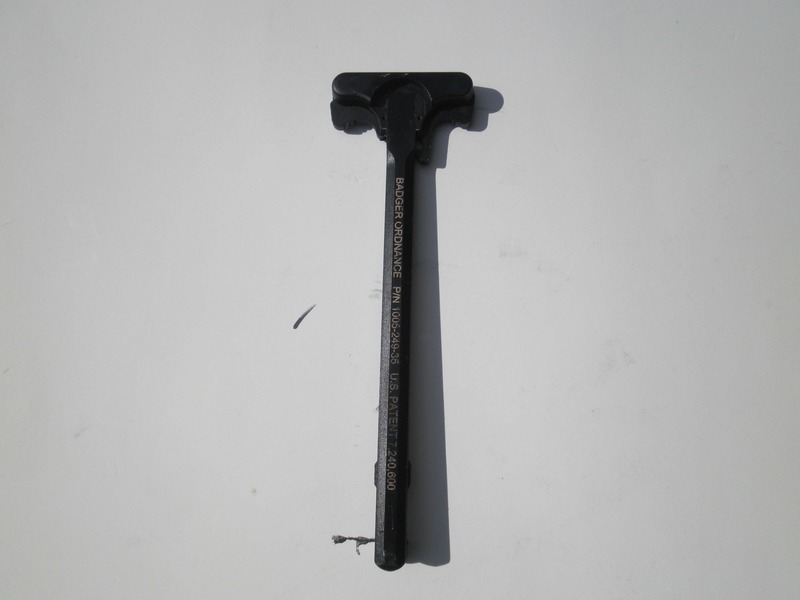 Ambi charging handle and it is in my opinion worth it. Its not a must have, but if you are a lefty it is very very nice and if you are not a solid follower of the gunfighter handle to the point of worship, its worth it. I like the gunfighter, but I like ambi a lot more. You have to be the judge if the ambi handle is worth it. The Badger ambi CH is as tough as woodpecker lips like most badger stuff. Very strong and durable. 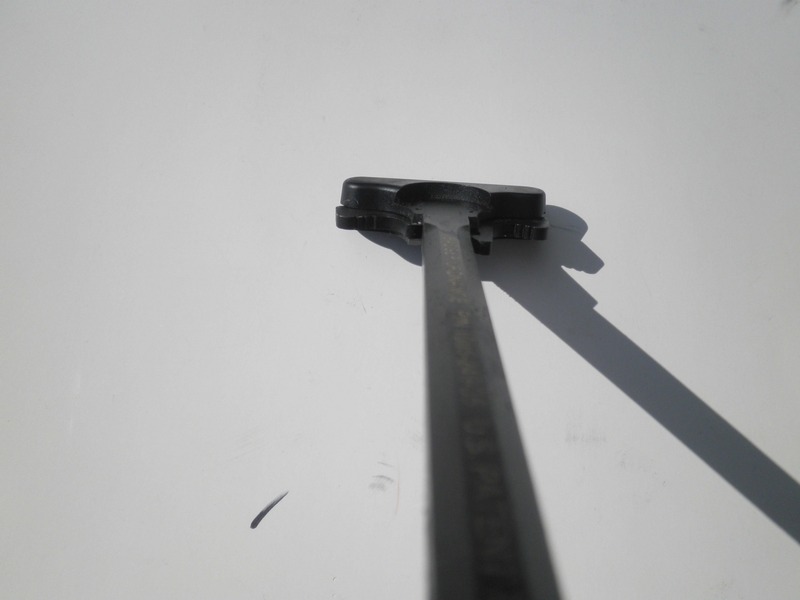 Being ambi, the charging handle has the latch on both sides. It locks up tight and positive and does not pinch. Its strong and has stood up to some pretty hard training and bouncing around in a police car day after day. Really I am not sure what else to say about this product. It is a charging handle so… It is hard to beat the BCM gunfighter , and I love the BCM but I have to say I was very impressed with the Badger. It is super tough and well made. Badger makes some super tough gear. I have been using Badger scope bases and rings for years on precision long range bolt guns for years in some very stout rounds and they have given me perfect service. Thats not to say I love all things badger, the free float rails they make seem pointless to me and the extended latch they make to place the factory CH latch, loves to break, bend and snap the pin holding it and drag on chest gear. That stuff it well made, just not for me. I do not recommend those things to you either( but you will do what you will). It is not made cheaply, it just has a niche and the BCM gunfighter has made alot of CH pointless now. The Badgerambi CH I believe is worth loosing the BCM latch if you truly want your gun to be as close to ambi as possible. That, however, will be a very personal choice further complicated if you run a can and need gas busting features. I do highly recommend you give it a very strong look. At the very least, you will not be let down in quality. I like to have a carbine with me. I like to have my trusty widowmaker with me wherever I go. In fact, if I could sling it across my chest every where I go I would be happy. I use to not be so paranoid, but things have changed over the year. Terrorist attacks, men jealous of my looks, urban crime and flash mobs on the rise, robots from the future and jilted women who had hoped to live up to the high standards to be m lover turned away have made me a lot more antsy in the last 12 years. I can’t carry my carbine out in the open like I would love to. Though, that does not mean I can not carry it out in public ( where legal). 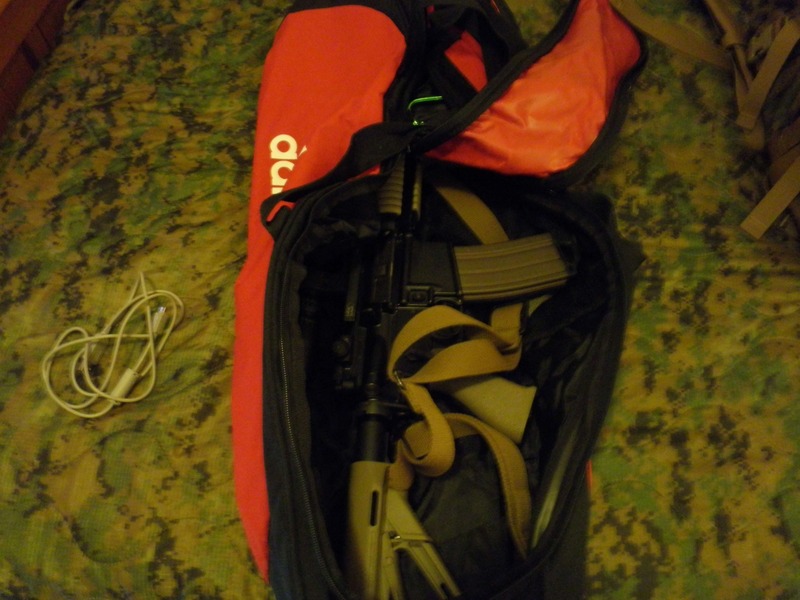 The trick is for it not to look like a rifle or a rifle in a rifle case. Most of the cases made to hide the fact they are not gun cases, usually fail at this. Anyone who knows anything about guns can spot one of these supposed covert cases because they still have that “look” about them. I came upon an idea while my girlfriend was going to college at a large university , to keep my precious with me while on the street walking past the university with all the students going by and none of them the wiser. My idea is certainly not original, but it was a pretty good idea for me anyway. I used the hide in plain sight method. 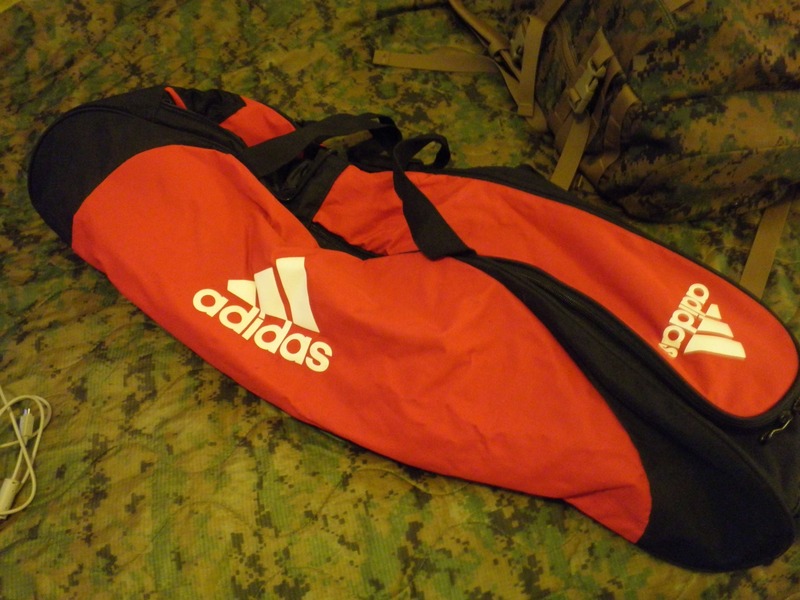 I bought an ADIDAS bag meant to hold baseball bats or tennis rackets or jock straps or whatever it is people who like or care about sports use to carry that crap in. While carrying my carbine in this bag, I was able to walk all over down town, past hundreds of liberal arts students with non having a clue. It helped that I acted like I was not trying to hide a “deadly assault rifle ” of course. It is legal in that state and the state I live in so I had no reason to worry or seem nervous. Acting like you belong and have nothing to hide and not fidgeting with it or you CCW sidearm I might add, is a habit that everyone should get into. A lot of people who have every right not to worry about CCWing seem to look guilty or worried when they first start to carry and it shows. I was able to eat at my favorite place, go into stores, the mall and walk around a small fair going on while carrying the bag and just look like a student going to the tennis court on campus later ( or whatever people who care about that non gun related crap do). The bag is a heavy kind of canvas/ plastic with some padding to protect the cricket bat or whatever it was meant to hold so it will protect the gun from light knocks,though that is not its purpose. It will hold a 16 inch carbine even with stock extended. I found it had a pouch for jock straps or some such, that would hold up to 6 mags,but that made too much noise and wanted to make it harder to carry and keep a reasonable shape. It has a double zipper flap that can be opened fast and the carbine deployed pretty rapidly considering. It also has two handles and some metal rings that allow a carrying strap so you can sling it over your back. Obviously I do not carry it everywhere and after the test mentioned it was used just to carry it in off the street and up into my GFs apartment for the weekend with no one knowing what it really was. It’s main duty now is to hold my “trunk” gun in my jeep. Few people would break into your car to steal smelly socks and jock straps or a baseball bat and that is what the case screams. Especially if you don’t to something dumb like leaving a plate carrier full of mags laying beside it. If you want to keep a rifle in your car but want to keep it low key, look around at normal household things that will hide your gun and not invite a thief or give away what it is. Check your state laws before you do any of this, people. I live in one of the top ranking states for gun freedom so I can do a lot legally that maybe some of you can not and I of course have a CCWD and that helps, not that its needed for the rifle as it is in my state. But check before you do any of this. It may be OK in your state it just can not be loaded. Be careful though, people wanting to hurt you are not the only thing out there that can ruin your life. A ambitious attorney wanting to make an example of an evil gun owner cando more damage and is more likely then any zombie alien invasion.